Disclaimer: I am not one for cheesy Christmas movies, so if this review seems a tad more sardonic than it needs to be, take it with a pinch of salt. 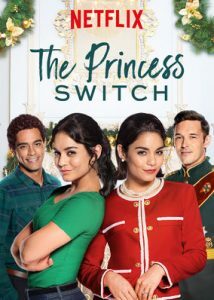 Released by Netflix on Nov. 16, The Princess Switch is a Christmas rom-com starring Vanessa Hudgens. She plays both Lady Margaret, a duchess who doesn’t want to be a duchess (bet you didn’t see that coming) and Stacy DeNovo, a baker from Chicago who loves being a baker. Along with her friend Kevin, Stacy signs up for a baking competition that takes place in Belgravia, a fictional European country. It also happens to be sponsored by Belgravia’s royal family, which is, you guessed it, Lady Margaret’s family. The two end up literally bumping into each other, figuring out they are long lost identical twins and decide to switch places for a few days. This is prompted by Lady Margaret’s desire to experience life as a “commoner” before getting married to Prince Edward, who is essentially a stranger to her. The movie’s plot had way too many gaping holes for me to ignore. Before we get into that, let me point out that Stacy DeNovo’s “secret ingredient” is vanilla extract. Vanilla. Extract. I’m no baking expert myself but I’m pretty sure vanilla extract is a vital ingredient, not a secret one. Especially in a cookie recipe. Moving on; let’s talk about the script. It is predictable and hole-ridden. Let’s breeze over the dull exposition the movie starts out with. It’s roughly fifteen minutes long, so hang in there. Or go make yourself some hot chocolate. Let’s focus on Hudgens’ characters instead. Margaret’s British accent is … rough. Stacy’s attempt is more convincing and they’re the same person. Margaret is also known to be camera-shy so no one knows what she really looks like. She’s free to go out in public without fretting about the paparazzi’s beady eyes. So why is it necessary for her to switch? All she needs is a good disguise. Preferably one better than her British accent. There’s still the royal family to worry about, which is probably where Stacy enters the picture. Weak reasoning, but it’s passable. After all, how will we get to the romance aspect? You know; that royal rom-com movie trope of “fall in love in days and get married for life.” Well, no one said they were realistic. Is there any chemistry between any of the couples? No, but since when did that matter? It didn’t even matter than Kevin effectively kissed a stranger. Plus, they barely had time to develop. At least in The Princess Diaries, Mia spent some time with Nicholas and still refused to marry him. Stacy is introduced as a baker and yet there’s barely any baking. We do get the predictable mean girl Brianna, who promptly stains Stacy’s apron. Is it too much to ask for a former competition winner who’s gracious for once? Brianna also tries to sabotage Stacy during the competition itself in the name of unnecessary melodrama. ‘Tries’, being the word here. The Princess Switch, complete with the ‘happily ever after’ ending, is a cliché fairytale. Depending on how much patience you have, you’ll find the movie cute or incredibly clumsy. Even for a rom-com, this isn’t a movie I would recommend.